The Black Eye Galaxy, also known as Messier 64 (M64), is a famous spiral galaxy located in the constellation Coma Berenices. The galaxy is also sometimes called the Evil Eye Galaxy or Sleeping Beauty Galaxy. It has the designation NGC 4826 in the New General Catalogue. 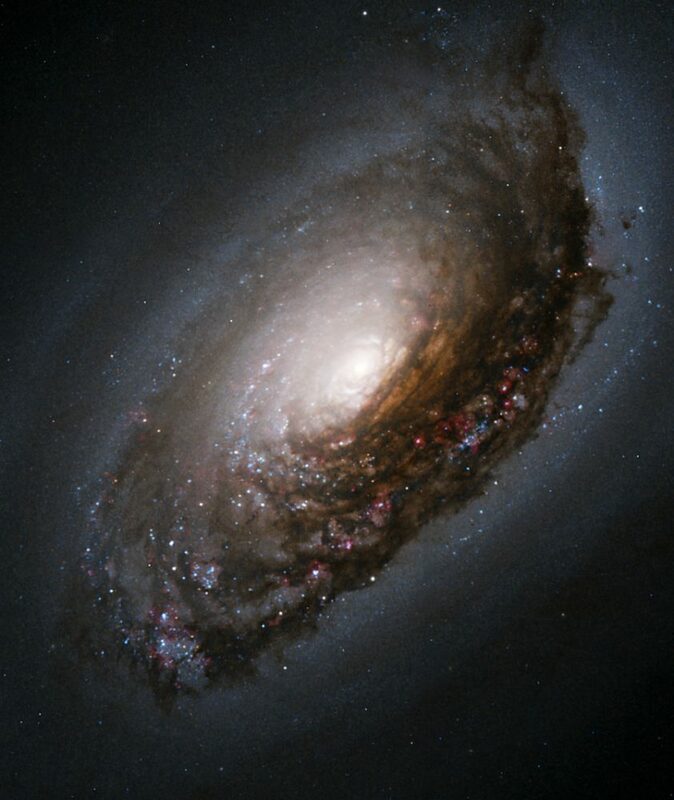 M64 lies at an approximate distance of 24 million light years from Earth. It is known for the enormous light-absorbing dust band in front of its central region, which has earned the galaxy the names Black Eye or Evil Eye. The dust band obscures the stars in the galaxy’s bright core. Like many other Messier objects, the Black Eye Galaxy is a popular target for amateur astronomers because its bright nucleus can be observed even in a small telescope. 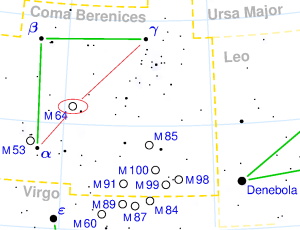 Messier 64 is also notable for being composed of two counter-rotating disks, roughly equal in mass. The inner disk contains the galaxy’s spectacular dust clouds and lanes. All the stars in the Black Eye Galaxy rotate in the same direction as the gas in M64’s core region, clockwise, while the gas in the outer regions rotates in the other direction. The gas in the galaxy’s outer regions stretches across an area spanning around 40,000 light years, while the inner region has a radius of about 3,000 light years and rotates at a speed of about 300 kilometres per second. The inner zone rubs along the outer disk and, as the two are rotating in opposite directions, this may explain the intense starburst activity in M64. The gases in the two disks collide, are compressed and, as a result, they contract, which triggers star forming activity. The possible explanations for the counter-rotating systems include a collision that led to a merger with a gas-rich smaller galaxy in a retrograde orbit or an ongoing accretion of nearby clouds of gas. The merger, which would have occurred roughly a billion years ago, may also be responsible for the galaxy’s ominous look. The dark dust lane obscuring the galaxy’s core may be the result of material that has been accreted from the former companion galaxy not having settled into the orbital plane of M64’s disk yet. The Black Eye Galaxy belongs to a small group of galaxies known as the M94 Group or the Canes Venatici I Cloud (CVn I Cloud). The CVn I Cloud consists of a loose group of galaxies approximately 13 million light years away in the constellations Coma Berenices and Canes Venatici. 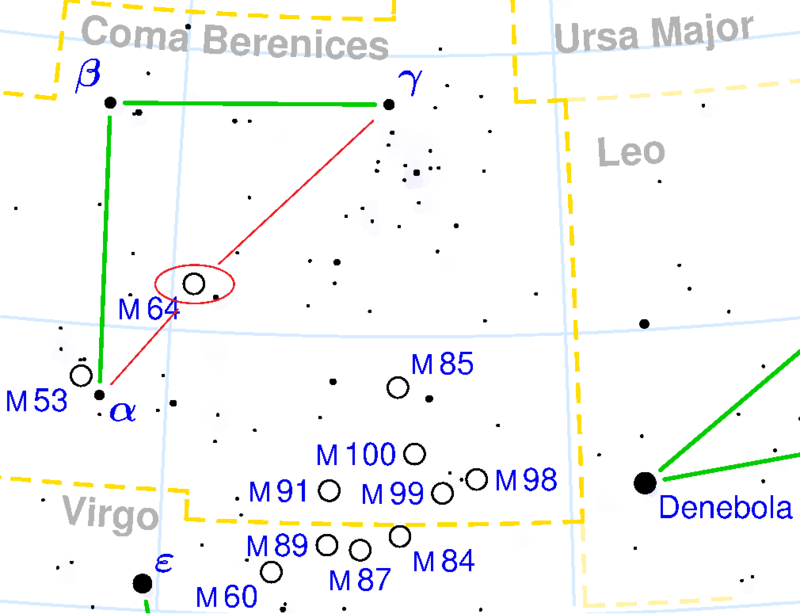 The M94 Group lies within the Virgo Supercluster. It takes its name from Messier 94, also known as the Starburst Galaxy. M94 is a spiral galaxy in Canes Venatici constellation. The Black Eye Galaxy is located about three quarters of a degree to the east-northeast of the 5th magnitude yellow giant 35 Comae Berenices. The star lies at about a third of the distance from Alpha to Gamma Comae Berenices. 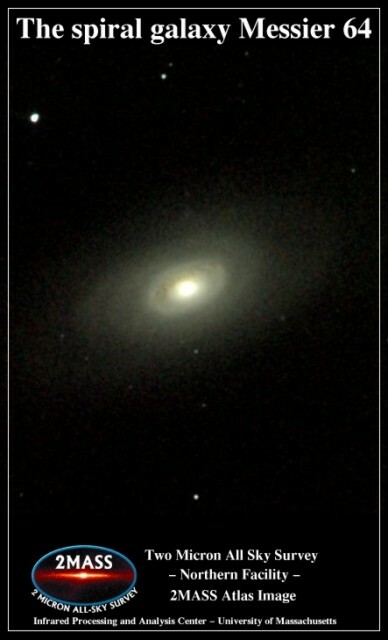 M64 can be seen in good binoculars in good viewing conditions, but the galaxy’s oval black eye can only be seen in telescopes of 10 to 15 cm aperture. Larger telescopes reveal the bright core and the many arms spiralling outwards in the galaxy’s inner region, and a single large arm encircling the outer region of M64. The Black Eye Galaxy was discovered by the English astronomer Edward Pigott on March 23, 1779 and then found independently by the German astronomer Johann Elert Bode 12 days later, on April 4. Charles Messier discovered the galaxy on March 1, 1780 and subsequently included it in his catalogue as M64. He described it as a “nebula discovered in Coma Berenices, which is about half as apparent as that which is below the hair.” He was referring to Messier 53, a bright globular cluster. Even though Pigott was the first to discover the object, his discovery wasn’t published until January 1781. Bode’s was published first, in 1779, while Messier’s came in the summer of 1780. The Black Eye Galaxy is a radio source and was catalogued as one. It has the designation PKS 1254+21. Astronomers have not observed any supernovae in the galaxy yet. 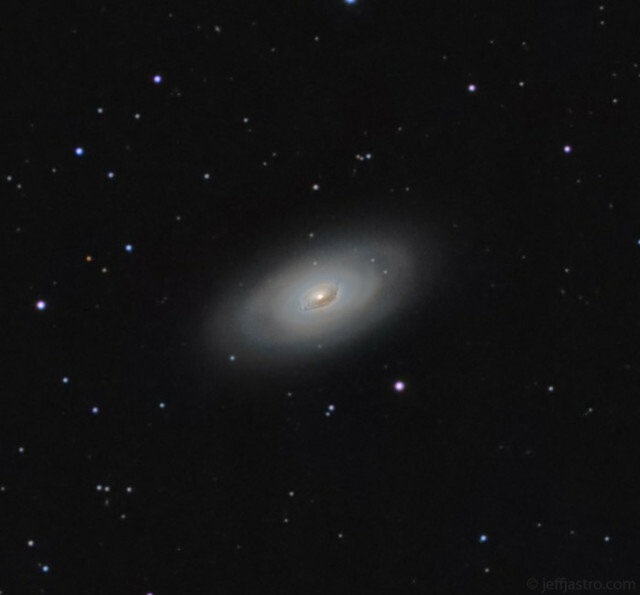 Messier 64 is receding from the solar system at an approximate speed of 408 kilometres per second. The spiral galaxy Messier 64. Image: Two Micron All Sky Survey (2MASS), a joint project of the University of Massachusetts and the Infrared Processing and Analysis Center/California Institute of Technology, funded by the National Aeronautics and Space Administration and the National Science Foundation. The galaxy’s distance is estimated at 24 million light years, but this is by no means certain as no Cepheid variables have been found in M64 yet despite the galaxy’s relative proximity. Any Cepheids in the galaxy should be visible in the telescopes currently used, possibly even the Earth-based ones. Different astronomers give different distances for M64, ranging from 12 to 44 million light years. In his Color Atlas of Galaxies, J.D. Wray has suggested that the Black Eye Galaxy may serve as a prototype for a class of galaxies called Evolved Second Wave Activity Galaxy, or ESWAG. M64’s main spiral arm contains intermediate aged stars. The stars were formed for as long as there was enough interstellar matter in the area. Once the material was no longer available, star forming activity slowly ceased and did not start again until enough matter accumulated from the evolved stars, by way of stellar winds, planetary nebulae, and supernovae. The second wave of starburst activity now appears to have reached the region where the dark lane of dust appears. The galaxy’s southern side is closer to us than the northern one.